The real estate market has for long courted the likes of Blackstone, GIC and Qatar Investment Authority (QIA) for the big deals in the ecosystem. But, it’s now falling in love with a new global giant that is firing up the realty investment landscape like never before. And that investment major is Canada Pension Plan Investment Board (CPPIB). The Toronto-headquartered firm has ramped up its activity in the Indian real estate market over the last one year or so and is engaged in talks with stakeholders at various levels all across the country. “It’s everywhere. It has been one of the top contenders for all the big-tickets deals that the market will see unfold in the coming days. It has looked at Hiranandani Group’s assets; it was a part of the bidders for DLF rental stake sale and other key deals in the market,” said a senior executive at a leading real estate consultancy firm, requesting anonymity. “If one had to scan the top deal-makers in the sector, let’s say a year ago, they would come up with a list of investors such as Blackstone, GIC, QIA and Brookfield. But, now CPPIB features among the investors for almost all the big-deals under discussion,” said the executive. Shobhit Agarwal, managing director, capital market and international director, JLL India, said the investor has its eyes on all the segments of real estate market. “There is no overarching theme that dominates its strategy in India. It is looking at all – retail, residential, commercial and industrial opportunistically. In fact, it is very keen for a play in the industrial real estate segment as of now,” he added. A detailed email query sent to the spokesperson for CPPIB for comments did not elicit any response till the time of filing this report. So, its ramped up activity has kept the media space abuzz with news about either its interest in setting up platforms or picking up stakes in assets of different kinds. Recently, VCCircle reported that the investor has emerged as a front-runner to pick up stakes in IndoSpace’s assets for industrial real estate play in India. Singapore’s sovereign wealth fund GIC and sister state investment firm Temasek, and Abu Dhabi Investment Authority (ADIA)—has lined up to pick up stake in IndoSpace through a private real estate investment trust (REIT) structure. VCCircle had also reported that the senior executives of CPPIB have met up with the management of The Phoenix Mills to buy into its retail assets – either by picking up stake in its existing assets or setting up a new platform. Business Standard also recently reported that CPPIB is out to strike deals on retail front and may tie up with public listed realtor Oberoi Realty for a platform deal. The report did not carry any confirmation on the story from any of the two sides mentioned. The list of its ongoing and upcoming deals can just go on. But, this is not the first time that CPPIB is trying to take a share of the Indian real estate pie. It currently has two joint ventures – one each for residential and commercial segment – with Piramal Fund Management (PFM) and Shapporji Pallanji Group, respectively. It has been able to seal only one deal under each platform so far. “It is unfortunate that its joint ventures with Indian partners have not panned out the way they were expected to. So, it is now aggressively looking at transactions on its own, outside of its JVs and limited partner (LP) backed funds. The residential platform should have finished deploying capital by now and the other one for commercial should have sealed a couple of more deals at least,” said a senior executive of a leading NBFC in India. Meanwhile, the firm is making rapid strides in the real estate ecosystem on its own as it has now an on-the-ground team in India. Last year, it set shop in Mumbai with an aim to clock ‘best risk-adjusted returns in India’. Mark Wiseman, president and CEO at CPPIB, had then said that the firm has five professionals in India and would be looking at growing the team as investment opportunities arise. Outside of real estate, it has lately bought 1% more in Kotak Mahindra Bank and formed a platform with the bank for stressed assets in India. It has so far also backed L&T Infrastructure Development Projects besides investing in third-party PE funds as a limited partner (LP). The real estate market of India is on the radar of CPPIB at a time when a slew of global investors has lined up to tap into the long-term potential of the sector. A mixture of old-timers such as Goldman Sachs, Warburg Pincus and JP Morgan and new comers in the form of Chinese and Japanese investors are out in the market, scouting for the right deal. The commercial segment of the market is hotting up as some of the biggest deals are around the corner. 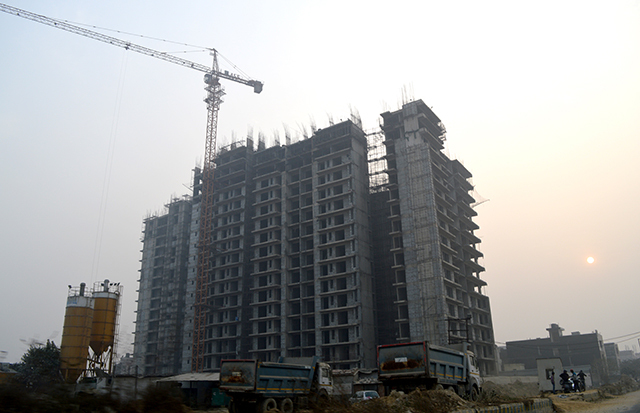 Brookfield is all set to seal the biggest deal that the Indian real estate market has seen in recent times. India’s biggest realtor DLF is in the last lap of selling the 40% stake of the promoter group in the rental arm of the company. And a slew of developers of commercial, retail and industrial real estate in the country are looking to monetise their assets, throwing a healthy opportunity for global investors to participate in. While the firm has set the ball rolling to lap up assets, it will be interesting to see how the journey shapes up. “I know and have heard that it is in talks with multiple partners but is yet to seal anything. I hope it does not miss the bus though it has entered a bit late as compared to its peers,” said a senior executive at Indiabulls Group. But if it continues the way it is going currently in the market, it might end up amassing income-generating assets on the lines of Blackstone and GIC, and eventually go the REITs way to mark full circle in the investment cycle.